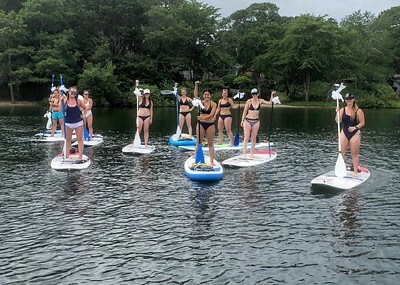 If you’re thinking about planning a bachelorette party for your bride to be on Cape Cod this summer then you’re not alone. Thousands of women flock to The Cape (what us locals call it) every summer to do just that and who can blame them. It provides the perfect backdrop for warm summer fun with tons of options as far as beaches, bars, nightlife and beautiful scenery. The people are friendly, the lobster rolls taste right on and all those gorgeous sunsets just can’t be beat. No matter what part of Cape Cod you settle on you will not be disappointed and with a little pre planning you can savor, sunbathe, explore, experience, and pamper your bachelorette selves silly. Maybe you’re thinking all this sounds great but we really want to do something new that allows our bachelorette group to have fun and connect in a different way. Active outdoor experiences are the best way to do this, and a bachelorette party combined with a paddle tour will really get your group flow going. There are many beautiful bike paths, hiking trails, and beach walks on Cape Cod. And if you choose to treat yourself with an on the water adventure, Peace Love SUP can help you plan the ultimate bachelorette experience. Stand up paddle boarding will allow you to enjoy time with your friends, see the beauty of Cape Cod and make lasting memories. There is no experience needed to enjoy paddle boarding. If you can swim, walk, and sit comfortably then you can stand up paddle board. We can customize your experience based on your groups ideas and needs and can include SUP Yoga or SUP Fitness as well. Don’t let your time on Cape Cod be all about the nightlife. Make some plans to fill your day with lots of fun and play.